This data set provides earth referenced radiance counts measured by the Forward Looking Infrared (FLIR) camera aboard the CARVE aircraft between April 2013 and November 2015 for the Carbon in Arctic Reservoirs Vulnerability Experiment (CARVE). The FLIR camera records images of the surface temperature while measuring concentrations of atmospheric carbon dioxide, methane, and ozone. Thermal images from the FLIR camera will be used to characterize land surfaces underlain by permafrost during specific phases in the freeze-thaw cycle. The measurements included in this data set are crucial for understanding changes in Arctic carbon cycling and the potential threats posed by thawing of Arctic permafrost. There are 5031 files in NetCDF (*.nc) format included in this data set. 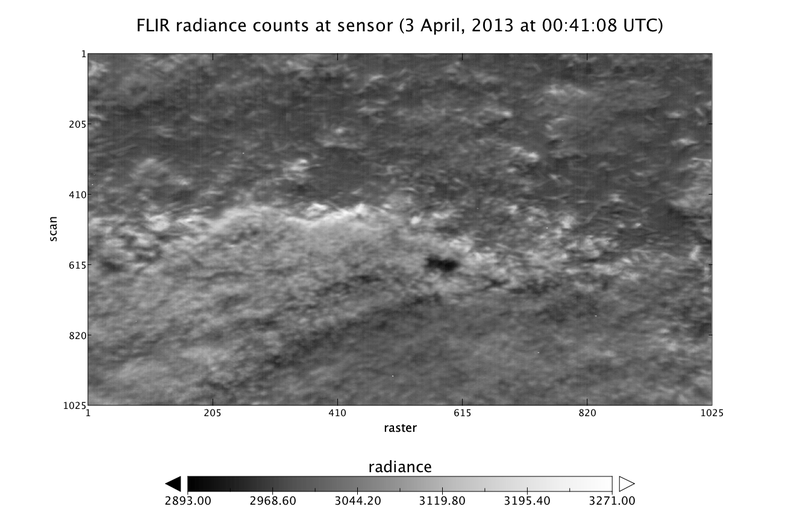 Figure 1: Infrared radiance of the land surface measured by the FLIR instrument onboard the CARVE flight on April 3, 2013. All FLIR Level 1 product data are stored in NetCDF (*.nc) version 4 file format. There are a total of 5031 data files. Each file provides earth referenced radiance counts captured during a portion of a CARVE flight. The number of files generated for a given day is dependent on the length of the flight. The discontinous temporal range for this product starts in April 2013 and ends in November 2015. The file naming convention is listed in Table 1. Global metadata attributes communicating information about the FLIR product and information specific to each file are described in Table 2. 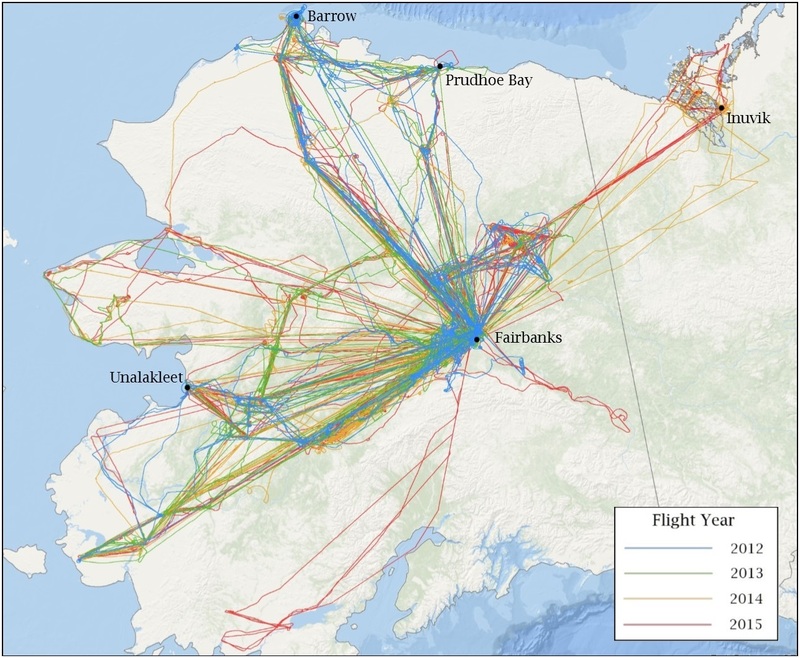 * Data from a single flight is spread across multiple files. frequency_of_sampling "1 second - < 1 minute"
master_quality_flag Succinct assessment of the quality of the data in the file: "Good", "Bad", or "UNK"
Each file contains 14 geolocation variables and 1 science measurement variable described in Table 3. Metadata attributes for the radiance variable, including polynomial conversion coefficients for converting digital numbers to standard units, are described in Table 4. Table 3. Data variables in each netCDF file. Fill value or missing data were set to -999.9 for all variables. Table 4. Metadata attributes for the radiance variable in the NetCDF files. The FLIR instrument was operated during the spring, summer, and fall seasons during clear sky conditions targeting ecosystem components that influence the carbon cycle. Thermal images from the FLIR camera aboard the CARVE aircraft may be used to study the role of seasonal freeze/thaw (F/T) processes in the carbon cycle, an important component to carbon and methane exchange with the atmosphere. Measurements of the temperature and the freeze-thaw state of various landscape components, including the soil and vegetation, may be combined with measurements of atmospheric gas concentrations to better understand the role of surface processes in the exchange of greenhouse gases with the atmosphere in the Alaskan arctic. Each NetCDF file contains a global attribute MasterQualityFlag that provides a summary indication of the data quality of the whole file. Values are set to: Good - all lower-level quality assessments passed; Bad - some or all lower-level quality assessments were not passed; or UNK - quality is unknown. The nadir-pointed FLIR-SC8200 camera on board the CARVE aircraft is used to measure upwelling mid-infrared spectral radiance at 3-5 microns at a rate of 1 frame per second. The instantaneous field of view (IFOV) of the FLIR instrument allows for a pixel resolution of ~36 cm from a height of 500 m. These high-resolution observations allow for the discrimination of individual landscape components such as soil, vegetation and surface water features in the image footprint. Here, Qx,y, is radiance in counts, Ci, is the ith degree polynomial conversion coefficient and, Lx,y, is mid-infrared radiance at the sensor in watts per steradian per centimeter squared (W sr-1 cm-2).